The Sonos SUB gets a new look as it falls in line with the latest Play 5 speakers aesthetics. The inside woofer of the new Sub is the same as before with only style changes this time around. 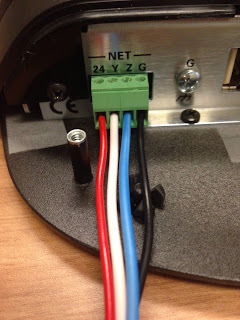 The new Sub has a new part number which is SUBG1US1BLK with a UPC of 878269002338. 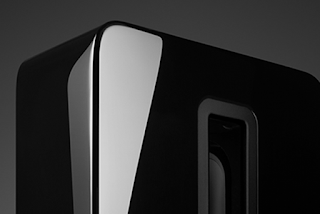 The new Sonos Sub is available in the dealer store soon and will start shipping August 10th. The image and link below is of the original Sub style and is still shipping until supplies last. The Savant 8.0 app is a great new edition to Savant's home control lineup. With the addition of full Sonos control, Savant has made leaps and bounds from the days of old (which is probably just last year knowing how fast technology goes). A great feature on the Savant 8.0 app is that it is compatible with the Apple iWatch. Assuming you have a functioning Savant system 7.0 version or higher you are able to utilize the Savant iWatch app functionality. There are two ways to access the Savant iWatch app on your smart watch with the first being from within your iWatch apps home screen and the second being from the glances watch menu. Since the inception of the iPad smart tablet from Apple, the smart device has revolutionized the remote control and user interface for using it as a smart home electronic control. The conveniences of the iPad including the multi-function usability with all the tasks and apps that can be used, extended battery life and affordable price point make it a superior remote control to many of the other dedicated electronic touch panels out on the market today. With all the options, features and tasks the iPad does it can also cause problems and annoyances when trying to simply use as a smart home control. The number one issue when trying to simply control your home or television is a pop-up notification from various apps and the iOS software itself that blocks your control app which hinders controlling what you are wanting to control. 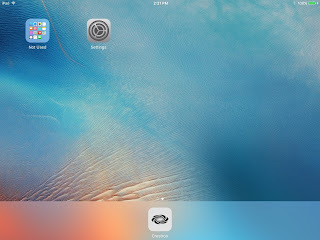 Simple settings adjustments on the iPad can greatly help the notifications annoyance that many control applications face when being paired with an iPad. 1. The first step to reboot a Crestron processor remotely is to setup and connect to the remote network with a VPN connection where the Crestron system you are working on resides. Setting up a VPN connection is beyond the scope of this article but this connection can be done utilizing a VPN router and a dynamic DNS service. 2. Once you have a successful VPN connection you can now open the Crestron toolbox program to initiate your connection to the processor. Within the Toolbox program open the text console and connect to the processor that you would like to reboot. Having an address entry for your processor will help streamline connecting to your processor. This can be done using the address book button located in the lower left of the text console. Once your address entry is complete you can simply select the correct entry in the drop down address box. 1. Within the Sonos application (app) press the menu button in the upper left corner. 2. Navigate and scroll down within the list and press the alarm option. 3. Select and press new alarm. 4. Set the time, room, music, frequency and volume for the alarm. Once all settings are complete press the save button in the upper right hand corner of the app and you have completed setting an alarm on your Sonos system. The new driver from MyDevice is now available on their website to integrate Amazon Alexa voice commands with system macros on an RTI smart home control system. The new driver allows you to use the Amazon Echo, Dot, Tap and Fire TV product to trigger events based on your voice commands. 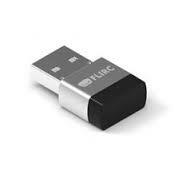 The voice actions that can be integrated with this driver are on, off, up, down, raise, lower, brighten and dim. Each voice trigger is given a unique name usually room location based to trigger the macros that are specified within your RTI system programming. The driver is purchased and downloaded for $100 but a free demo driver is available for download to test out this great new control driver from MyDevice. "Alexa, turn on the bedroom lights"
If you live in the Southern California area the best FM station around is KCRW which is 89.9 on your FM dial. If you are listening to the radio from the Coachella Valley than you tune your dial to 89.3 to catch the NPR affiliates music and news programs. KCRW is also available from the Tunein radio service for free which can be conveniently streamed from your Sonos system. For the best news, information and music recommendations KCRW is your choice not only in Southern California but all over the world with their streaming service online 24 hours a day 7 days a week. 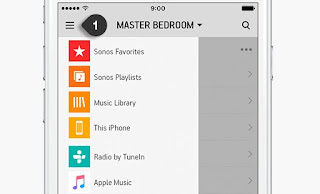 When using the Sonos phone or tablet application press the room name at the top of the Sonos application. 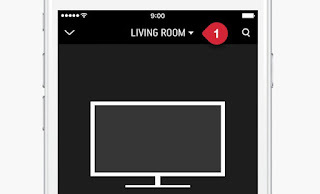 If you have a Sonos Playbar playing your TV audio you will see the TV icon as shown above within the respective room that it is located in. Press the group button next to the room audio you are trying to distribute out to the other rooms. IE Living room audio is going to be sent to the rest of the Sonos zones within the house. Press each room name and put the red check mark next to all the areas you would like to distribute the TV audio to. Press done in the upper right had corner of the Sonos app and now you have successfully distributed the TV audio to all the Sonos areas of your house.